CynTax is known on the track for her endurance, speed, agility, and wily jammer moves. In a sport where size often matters, this 5 foot tall, 110-pound skater uses her small stature to her advantage by deftly sneaking through the pack unnoticed. 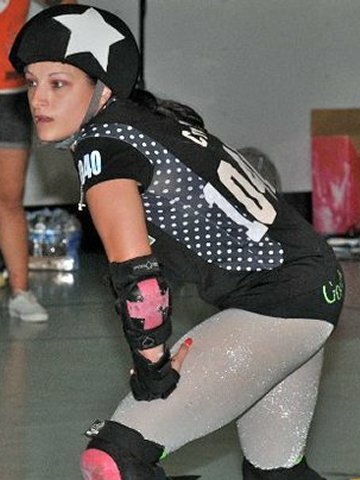 She has received several accolades over her 4-year derby career, including Jammer MVP (Most Valuable Player) on 9/11 against SAC, KillaBytes’ 2009 Takes a Lickin’ and Keeps on Tickin’ award, and she skated 315 laps (approximately 24 miles) in 2 hours at our first annual skate-a-thon fundraiser in 2009. I watched the Rollergirls reality show on A&E in early 2006, and they mentioned that teams following the new format of all women’s, full-contact roller derby were springing up everywhere in major cities across the country. I knew after the first episode that the sport, the culture, the athleticism, and the lifestyle were for me, so I looked online and found the B.ay A.rea D.erby Girls of Oakland, the only Bay Area team in existence at the time. I joined B.A.D. Girls in January of 2006 after a short stint with the San Francisco Bay Bombers. After suffering a painful back injury, I retired from B.A.D Girls in June of 2007. I thought my derby career was over, but after lots of physical therapy, my back healed and I felt the derby itch once again. Looking for a team closer to home, I found the Silicon Valley Roller Girls in August of 2008. What kind of skating skill or athletic abilities did you have before starting derby? I was very heavily into gymnastics competition all through my childhood. I really feel this training has been extremely helpful in roller derby. In particular, it has helped me to better take falls by rolling out of them or “crumpling” to reduce the impact to any one particular part of the body. As far as skating goes, I am a child of the 80’s, so skating parties were a weekly staple in my life. Until I started my roller derby career in 2006, I hadn’t skated since the late 80’s. It was like riding a bike in some ways, but it still took time to build upon those basic skating skills. How did you derive your derby name and number? I'm an accountant and that’s semi-unusual in the derby world, so I wanted my skate name to reflect my profession. My full skate name is supposed to be CynTax Terror, but I wasn’t quick enough to add the Terror part to the national registry. The number, 1040ez, is the standard short form for tax preparation. Get it – short form? During tax season it really is CynTax season because I’m working crazy hours while trying to keep up my attendance at derby practice, so I can make the rosters. What do you contribute to SVRG and roller derby in general off the track? My current role with SVRG is as the announcer liaison on our bout production committee as well as one of three WFTDA reps for our league. As the announcer liaison, I seek out great announcers for our bouts, keep them informed as to our timelines and needs as well as making sure their needs are met. I prepare a 20-page handbook for each bout that details anything and everything our announcers would need to know to make MC-ing our bouts go as smoothly as possible while making it as interesting to listen to as possible. As the voting WFTDA rep, I keep a close eye on the national WFTDA forum looking for any mandatory votes our league needs to participate in to keep our membership in good standing. I gather the materials needed for our league members to cast their votes and then I transmit our league vote to WFTDA. In the past, I was the finance committee head for the B.A.D. Girls, and I spearheaded the submission of their nonprofit application to the IRS. I believe we were one of the first or second leagues in the country to do so. This paved the way for other leagues, and now it’s pretty much the standard practice for roller derby leagues to go through the application process to become a nonprofit organization. Years ago, it was a big deal to get the IRS to recognize roller derby as a nonprofit sports organization that promotes female athleticism. We had to fight tooth and nail for it. I am pretty active. I think participating in other forms of physical activity when you do a physically demanding sport such as roller derby is important. I like to run, lift weights, participate in yoga, golf, or anything that comes my way, really. I also like to cook. I don’t have time to do it often, but it’s the only creative thing I do. I get in trouble if I’m too creative at work, lol. I started a book club for our derby league. We have about a dozen members. We discuss one book a month. Each member contributes a book, and I really like this idea because it gives us all new things to read that we might not have normally chosen on our own. I’ve been pleasantly surprised by some of the selections. What are your long-term derby goals? I would like to keep playing roller derby for as long as my body will allow me to. I’ve suffered lots of derby-related injuries, including a broken nose, ribs, and fingers. I’ve had lots of problems with my back and knees from the stresses skating puts on the body. I guess if I had to pinpoint a goal it would be to one day be the oldest member on the league. I’m gaining on the few members older than me. What advice would you give women interested in playing roller derby? It’s a little intimidating to join a league, but well worth it if you can muster up the guts. Things are much more organized these days. Our league has a bootcamp we put on a few times a year to train beginners in the basics and help them pass their minimum skills tests and ultimately become a league member. So, I guess my advice is to first decide if you’re serious, because it takes a lot of practice, time, blood, sweat, and tears. If you are serious and you give it your all, you will discover some of the most rewarding things in life, make new friendships, and become more fit than you’ve ever been. After you have decided to make the commitment and be serious about it, don’t let the setbacks ruin your enthusiasm. I was lucky that I had years of skating under my belt when I started derby, but I had lots of obstacles to overcome with my size. I didn’t get put on my first roster until I was with SVRG for nine months. Derby comes naturally to some, but more often than not, it’s a skill that takes lots of practice to learn. Being a good skater is only half of it.